The lungs of birds are wedge-shaped, relatively small and poorly elastic. 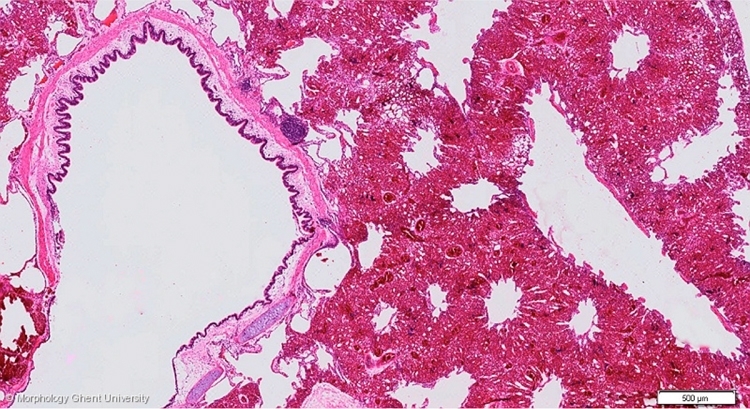 Avian lungs do not have blind ending alveoli as mammalian lungs but anastomosing air capillaries (pneumocapillares). Entering the lung, each primary bronchus (bronchus primarius) gives rise to 4 groups of secondary bronchi (bronchi secundarii) which are mutually connected by a network of tertiary bronchi (bronchi tertiarii) or parabronchi. The parabronchi and surrounding tissues can be considered as the lung unit. The walls of the parabronchi contain air capillaries closely intermingling with blood capillaries thus making gas exchange possible. Arterioles and venules can be found in the interparabronchial septa (septa interparabronchialia). Bigger blood vessels run with the branching of the primary and secondary bronchi.